COEN is located in North Baltimore just east of I-83 at exit 10A. Once you reach the Village of Cross Keys (see local map below) you can turn right at the gate house, but it is suggested that you continue 3/10 mile further on Falls Road to the second entrance. 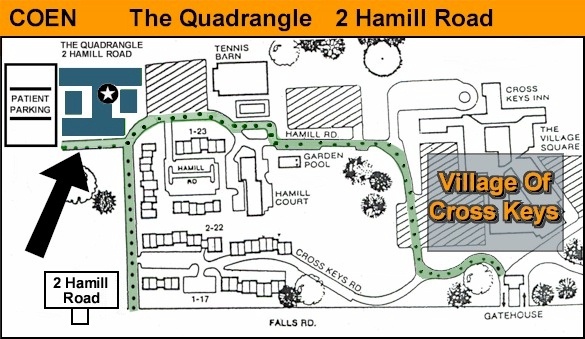 You will see a sign for The Quadrangle, 2 Hamill Road. Turn right and continue driving and make your first left turn that will take you to the patient parking lot in the rear of Quadrangle. We are in the Center Quadrangle, Suite 225 (1st door on the right). 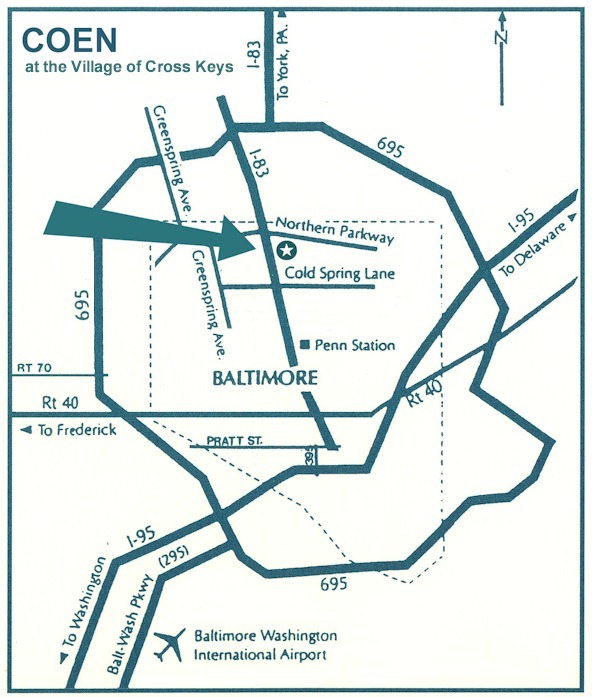 Our office is located at The Village of Cross Keys in Baltimore, Maryland. Click here for directions and map to our office. Take entrance for I-83 north. Take I-83 north to exit 10A [Northern Parkway East). On Northern Parkway make a right turn at the first traffic light (Falls Road). 1 mile on Falls road is the gatehouse for the Village of Cross Keys. Follow the local map above. From I-70 (Frederick and West) to the Baltimore Beltway, I-695, Towson. Follow I-695 to Exit 10A, Northern Parkway East. On Northern Parkway turn right at the first traffic light, Falls Road. 1 mile on Falls Road is the gatehouse for the Village of Cross Keys. Follow the local map above. Take I-95 to Baltimore Just south of the city, take Exit 53 (I-395) into the city. I-395 divides, Keep to the left (don't veer right onto Martin Luther King Jr. Boulevard). Continue on I-395 into the city, turning right (east) onto Pratt Street at the Inner Harbor until you come to President Street just before "Little Italy". Turn left (north) onto President Street President Si Runs directly into I-83. Take I-83 to Exit 10A, Northern Parkway East. On Northern Parkway make a right turn at the first traffic light, Falls Road. 1 mile on Falls Road is the gatehouse for the Village of Cross Keys. Follow the local map above. From the Baltimore Beltway, I-695W take exit 23, the Jones Falls Expressway (I-83 south) to Exit 10A, Northern Parkway East. On Northern Parkway turn right at the first traffic light, Falls Road. 1 mile on Falls Road is the gatehouse for the Village of Cross Keys. Follow the local map above.